Many ponds composed of a variety of soil types are prone to water loss by seepage. This water loss can be controlled by the application of a sodium bentonite clay called Pond Sealer. Pond Sealer is a high swelling, chemically unaltered, sodium bentonite that contains no additives. It is an economical and environmentally safe way to accomplish pond and lake sealing to reduce seepage losses. Sodium bentonite is a natural sealant and can be used for sealing recreational ponds, farm ponds, stock tanks, retention ponds, and waste water treatment lagoons. Sodium bentonite is a natural clay which has the characteristic of swelling many times its dry size when it becomes wet. When bentonite is applied in a layer over porous soil or when it is mixed with a porous soil, and moistened with water, it forms an impermeable layer. When properly applied, bentonite does not affect the water or wildlife. Pond Sealer is easily applied. In the case of small ponds, bentonite can be applied with simple hand tools and for larger ponds can be applied using ordinary farm equipment. All side slopes should be at a 45 degree or less angle so that the material will stay in place. Pond Sealer makes an excellent liner for new pond construction, for sealing existing ponds with seepages, or for spot treating specific problem areas. When sealing a leaking pond to prevent seepage, bentonite can be applied directly to the soil in the pond bottom or it can be sprinkled on the surface of the water and allowed to settle to the bottom. Soil type, pond size and pond depth are all key factors in determining the amount of sodium bentonite required to seal ponds. The more porous the soil, the more bentonite is required to reduce the porosity and create a seal. 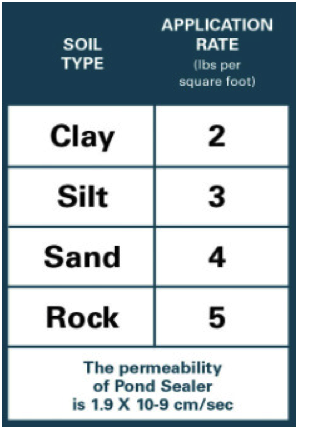 If the size of the pond has been determined and the soil type is known, the chart shown can give an estimate of the amount of bentonite required to seal a pond. This chart is based on water depth of up to 8 feet. For depths greater than 8 feet Since greater water depths increase the pressure on the bottom of the pond, increase the application rate listed in the chart above by one pound per square foot for every 8 feet of additional water depth. For example, add one pound per square foot to the “Application Rate” for depths of 8′ to 16′. Add two pounds per square foot to the “Application Rate” for depths of 17′ to 24′, and so on. There are 3 basic application methods for sealing ponds, which are all explained in detail below. The first 2, the Blanket Method and the Mixed Method are more or less equal in terms of effectiveness. Both require application of the bentonite directly to the soil, so if you are sealing an existing pond, the pond would have to be drained to apply the material. The 3rd method, the Sprinkle Method is not as effective as the first 2 methods and really is only recommended in cases where the exact location of seepage is known and is in a relatively small area in which spot treatment is feasible. The Blanket Method is an effective method for sealing leaking ponds with bentonite, however, more care is required during its application. Pond Sealer, a mixture of powder and granular sodium bentonite, is best suited for this method unless working in an extremely windy area, in which case, we would recommend Granular Seal which is bentonite in granular form and contains no powder. The first step is to prepare the surface to be sealed. Remove all rocks, trash, and vegetation, including trees and roots. Roots left in the ground will decay over time, leaving the potential for future leakage problems. Remove the top 4″ – 6 ” of the soil from the pond bottom. Fill any deep holes or crevices with a uniform mixture of one part bentonite to five parts soil. Then smooth the area by roller or drag. Cover the area with the prescribed amount of sodium bentonite. It is very important that the bentonite layer is even and that there are no bare or thin spots. This will ensure complete coverage and a water tight seal. The bentonite can be spread over the area to be covered with a fertilizer or seed spreader, or with a front-end loader. After the bentonite has been spread as evenly as possible, carefully replace the 4 to 6 inches of soil that was removed earlier. While spreading the soil, be certain not to disturb the bentonite layer, as this could leave bare spots which could allow water loss to continue. If livestock will have access to the pond, the cover coat must be thicker than 4 inches. In this case, a top layer of gravel would be best to protect against puncture by cattle hooves. Finally, compact the pond bottom by rolling or tamping. Use care when filling the pond. A gentle water flow is recommended to prevent erosion of the soil and bentonite layers during this final phase. It may take several days for the bentonite to reach the point of full saturation and fill the voids in the underlying soil. If a considerable amount of time elapses between applying the bentonite and filling the pond, it may be necessary to protect the treated area against drying and cracking. A mulch of straw or hay pinned to the surface by the final passes of the sheep foot roller gives this protection. Use rock riprap or other suitable material to protect areas where water inflow into the treated area is concentrated. In all methods of application, what prevents seepage and stops leaks is the swelling of the sodium bentonite particles. Bentonite will not stop the leak immediately, some seepage is to be expected for several days or possibly several weeks after the bentonite is applied. Due to underlying circumstances such as rocks, roots, and underground springs, some ponds require more bentonite pond sealant than the recommended amount. It is possible that some ponds may never seal completely due to poor site selection, improper design or poor construction techniques. We, therefore, cannot guarantee that this product will completely seal every pond in which it is applied. For application of the Mixed Method, begin by preparing the surface to be sealed. Remove all rocks, trash, and vegetation, including trees and roots. Roots left in the ground will decay over time, which leaves the potential for future leakage problems. The soil level in the area to be treated is important. Investigate it before applying the bentonite. The moisture level should be optimum for good compaction. If the area is too wet, postpone sealing until moisture conditions are satisfactory. If it is too dry, add water by sprinkling. Fill all deep holes or crevices with a uniform mixture of 1 part bentonite to 5 parts soil, and cover and compact areas of exposed gravel with suitable fill material. Plow, disc or till the bottom of the pond 2″ to 6″ deep, then roll or drag the surface until it is smooth. This initial plowing and blending of the soil will assure consistency of the soil throughout the bottom of the pond before the bentonite is mixed into it. When this is complete, apply the prescribed amount of sodium bentonite. We recommend Pond Sealer, a mixture of powder and granular sodium bentonite for this application. The bentonite can be spread by several different methods, however, we recommend a fertilizer or seed spreader to ensure even spreading. Once the bentonite is spread over the area, mix the bentonite with the top 1″ to 4″ of soil by discing, tilling, or by hand raking. It is extremely important for the bentonite to be mixed uniformly with the soil. Do not till deeper than 4 inches as this will dilute the effectiveness of the bentonite. To ensure that no bare or thin spots will be left, we recommend multiple passes over the area. If livestock will have access to the pond, the cover coat must be thicker than 4 inches. Finally, compact the pond bottom by rolling or tamping. Use care when filling the pond. A gentle water flow is recommended to prevent erosion of the soil/bentonite layer during this final phase. It may take several days for the bentonite to reach the point of full saturation and fill the voids in the soil. If a considerable amount of time elapses between applying the bentonite and filling the pond, it may be necessary to protect the treated area against drying and cracking. A mulch of straw or hay pinned to the surface by the final passes of the sheep foot roller gives this protection. Use rock riprap or other suitable material to protect areas where water inflow into the treated area is concentrated. In all methods of application, what prevents seepage and stops leaks is the swelling of the sodium bentonite particles. Bentonite will not stop the leak immediately, some seepage is to be expected for several days or possibly several weeks after the bentonite is applied. Due to underlying circumstances such as rocks, roots, and underground springs, some ponds require more bentonite pond sealant than the recommended amount. It is possible that some ponds may never seal completely due to poor site selection, improper design or poor construction techniques. We, therefore, cannot guarantee that this product will completely seal every pond in which it is applied. The sprinkle method is recommended only when it is not feasible to drain the existing pond or in cases of isolated leaks when a spot treatment may be a possible alternative. This method is less effective than the other two methods for several reasons: 1. Uniform and accurate placement of the bentonite is difficult. 2. The pond bottom may include debris such as trash, vegetation, logs, rocks, etc., which may prevent sufficient coverage. 3. Soil / bentonite compaction is not possible with the Sprinkle Method as it is with the other 2 application methods. If the bottom of the pond can be cleared, this method has greater chances of providing a good seal. The granular grade of bentonite, Granular Seal, is best suited for this method of sealing leaking ponds. The granular bentonite should be used when using the sprinkle method because the particles are large enough to sink to the bottom, while finer particles would cloud the water and stay in suspension. Begin by simply sprinkling the prescribed amount of granular bentonite Granular Seal on the water surface and allow it to fall into place. The granular bentonite particles will sink to the bottom of the pond where they will swell and reduce the seepage rate. The granular bentonite can be spread by hand or distributed over the pond surface by using a mechanical fertilizer or seed spreader. Even distribution insures adequate coverage. In all methods of application, what prevents seepage and stops leaks is the swelling of the sodium bentonite particles. Bentonite will not stop the leak immediately, some seepage is to be expected for several days or possibly several weeks after the bentonite is applied. Due to underlying circumstances such as rocks, roots, and underground springs, some ponds require more bentonite pond sealant than the recommended amount. It is possible that some ponds may never seal completely due to poor site selection, improper design or poor construction techniques. We, therefore, cannot guarantee that this product will completely seal every pond in which it is applied. The bentonite can be packaged in 50 lb. bags, 3,000 lb. bulk bags / super sacks, or it can be delivered in end dump trailers or hopper trucks. A maximum of 900 (50 lb.) bags or 15 (3,000 lb.) bulk bags will fit on a flatbed truck (45,000 lbs. or 22.5 tons max). Contact us for freight rates to any location. For more information, go to pondsealer.net.